PCO’s new pco.panda 4.2 camera system is the peerless single-cable-solution in state-of-the-art sCMOS imaging technology. Operating through a USB 3.1 interface brings remarkable advantages as it provides PCO’s new generation of cameras with high data transfer speed and direct power via the one USB cable making external power supplies redundant. Compact dimensions of roughly 65 x 65 x 65 mm and a resolution of 2048 x 2048 pixels make it suitable for countless applications. The integration of Camera Link HS into PCO sCMOS camera systems constitutes the combination of a great range of benefits. In addition to the renowned pco.edge and pco.panda features it allows 1.1 GByte/s data bandwidth per lane with a fiber optic cable length up to 10 km. At the same time very high data reliability is achieved, avoiding communication errors and enabling best signal integrity. Besides being one of the three developers of sCMOS sensor technology, PCO also contributed to advancing neuro and life science research with the introduction of the FLIM camera. The measurement of the fluorescence lifetimes can be an important parameter in bio imaging. The pco.flim camera system simplifies these measurements. It is the first luminescence lifetime camera with a dedicated state-of-the-art CMOS image sensor enabling access to a wide range of lifetimes, from tenths of micro seconds to single nanoseconds without changing instruments. 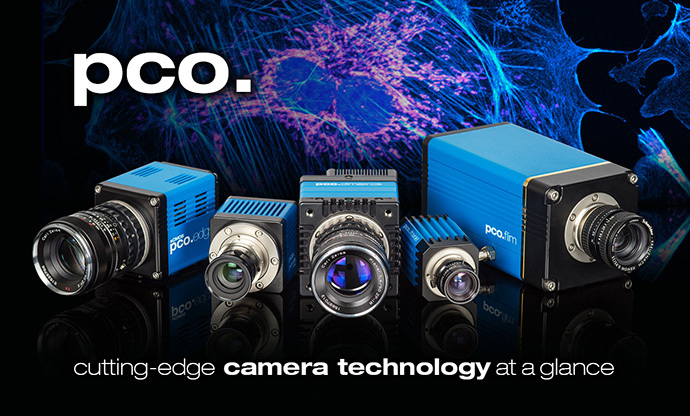 PCO is pioneering a new generation of high-performance cameras enabling its customers to achieve the highest resolution, dynamic range, quantum efficiency and frame rates while providing the lowest readout noise. Are you interested? PCO will showcase their cutting-edge camera technology at this year’s “LASER world of PHOTONICS” expo in Munich, Germany from June 26 – 29, Visit PCO & talk to their experts at booth A2.103.